Do you want to have a better understanding of your project progress? SSW Agile Template is built on top of MSF Agile Template, and it has customized work item types to help you track your project as well as identify issues. Check our Rules to Better Project Management with TFS for more details. Baseline tracking With our SSW Agile Template task work item, you can enter baseline work for each task; together with Remaining work and Completed work, it allows you to track your progress and budget usage. Additional Task Additional requirement is common in software project, however this kind of task will affect your delivery schedule and blow out your budget; using SSW Agile Template, you can put additional task into different category, which allow the project manager track these sensitive items easily. URL Link your work item with the actual URL of the website page; this is especially useful when you have a big amount of pages to maintain. Description, support HTML HTML is extremely useful to describe the requirement; the old MSF Agile template doesn’t allow you to use HTML in your description, we finally have this fixed in our template. Release Plan Report Release plan report will give you an overview of the project, and help the project manager have a better idea of the work load. View our sample report on our real project SSW Code Auditor. Release Update Report Client involvement is one of the key factors in Agile Development Process, SSW Release Update Report can easily help your client to understand the progress as well as help the project managers to identify issues and take action. 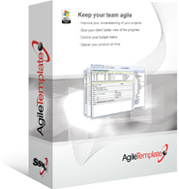 View our sample report on our real project SSW Agile Template. If you think that one of our rules is incorrect then please tell us about it.